The introduction of Faction Warfare littered low security space with complexes. Although they are technically a part of FW, their primary function is to generate conflict. As such they fulfill their purpose well – not only for militia, but for all residents of lowsec. Knowing how to fight in and around them is essential to getting the most out of the lowsec PvP experience. Today’s Lowlife attempts to save you from ‘learning by dying’ with a thorough view on plex fighting tactics. The correct name for FW plexes is ‘Faction Warfare dungeons’, but as you will know if you read the Lowlife FW glossary, this name is virtually never used. Even in the official documentation from CCP there are naming conflicts. 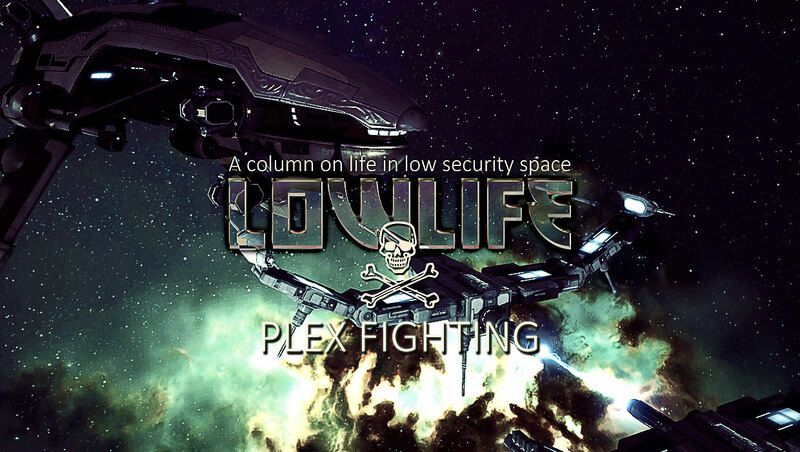 Plexes readily provide a diverse palette of fights for a large proportion of lowsec inhabitants and are central to the active PvP culture that thrives in there. The pivotal function of plexes in Factional Warfare means they naturally attract players. Their mechanics motivate a wide population of space rather than a focused one, spreading players out and opening opportunities for interaction. The result is an inhabited world where many are willing to fight and small gang warfare comes about organically. Defending and assaulting a plex involve distinct tactics. Differentiating between them and understanding what those contrasts mean in practise, both strategically and hardware-wise, is important and often the difference between victory and defeat. The most basic way of using plex mechanics to one’s advantage is utilizing the above mentioned ship restrictions to good effect. Ideally the ship type used to hold a plex should be the most potent that plex will allow. By virtue of this the defender ensures a level playing field, assuming potential attackers are equal in number. A suitable plex is found using the system- and directional scanners and the overview. The system scanner will list all the plexes available in the system. By initiating warp to a plex it is ‘opened’, unless already open. Open plexes appear on the overview for anyone in the system. When the target plex is open, unless already so, it is advisable to warp to a location from which it is within directional scanner range, 14.35 AU, and scanning it for inhabitants first. Whether by ignorance or negligence pilots that skip scanning will find themselves easy targets for cunning PvP-ers. Once an empty plex has been entered (we’re assuming the role of the defender here) the directional scanner becomes an early warning system. Setting the scanner to 360 degrees and short range (~0.5-1.0 AU) allows for the detection of any ships on approach to the plex gate. Assuming there are hostiles or pilots of unknown affiliation in the system the scanner should be used at short, regular intervals, 10-15 seconds between each scan. Not scanning for 25-30 seconds for instance means that fast frigates could enter the plex without warning. The singularly greatest advantage a defender has is dictating initial range. Ideally the ship used is fitted to get the most out of this advantage, establishing and maintaining range control or otherwise using the fact that all targets start stationery and from the same location to its utmost. There are five primary ways to do this: brawling, scrambler kiting, kiting, sniping and alpha strike. The tactics discussed below assume the reader has a rudimentary understanding of their set up and function outside of plexes (you can read about some of them in more detail in the Lowlife solo-PvP guide). Brawling: The combination afterburner, warp scrambler and stasis webifier is referred to as the holy trinity of brawling plex defense – for good reason. A brawling ship should orbit the warp-in beacon at 500 meters and lock any targets that come in as soon as they appear on the overview. Applying tackle to a target at this stage and getting as close as possible is critical. This setup is well suited for fleets. Scrambler kiting: The scramble kiter’s primary concern when a target enters the plex is not only to apply tackle quickly but also to establish the preferred range as soon as possible. Orbiting the warp-in beacon at 3-4 km while waiting for the target to enter is common. It is important to keep track of the enemy’s direction and velocity and a skilled pilot will utilize manual flight to establish range dictation. What this fitting doctrine lacks in DPS compared to the brawler it makes up in flexibility, making it an excellent choice for solo plexing. It is however not well suited for fleet fighting. Kiting: Defending a plex is ideal for the true kiter as orbit within warp disruptor range can easily be established. Ships typically used for kiting are known however and it is not uncommon that an enemy will bring a counter. As a kiting pilot it is important to understand these counters and anti-kiting tactics such as slingshotting and pulling (when more than one enemy is involved) as well as being proficient at manual flight. A tackled kiter is a dead kiter. Expert pilots can use kiting in small gangs but it is otherwise not recommended for fleets. Sniping: A sniper’s ideal target is stationary and at range, making defending a plex very suitable. Snipers have several crucial weaknesses that must be considered however. Initially it must be moved to its preferred range, at which point it is very vulnerable. They also typically lack any real tank and are considered dead if tackled. With this in mind a pilots in a sniper should always be aligned out or make certain it has the sufficient speed to stay out of the range of tackle. Given their engagement range they are not suitable for running plexes, making them of limited use for Faction Warfare militia unless extremely fast or paired with bait tanks intended to take enemy fire, apply tackle and run the plex timer. The sniping doctrine is well suited for fleets but requires skillful target calling. Alpha strike: This type of ship benefits from plex mechanics much in the same way as it does from those that govern star gates – only better. Unlike star gates, ships that enter a plex do so at a predefined point. Alpha strike fleets set up in plexes with an experienced target caller are deadly efficient, but lack any staying power. This doctrine should only be flown in fleets. The initial tools for plex assault are the overview, directional scanner and local. The overview will show all the plexes currently open in the system, the directional scanner will reveal if a plex is occupied and local should be surveyed for potential back-up any targets may call. A plex is entered by warping to 10 km from the gate and activating it. Warping to zero km should be avoided as there is a risk the ship may be ‘stuck’ on the acceleration gate itself and have to spend precious seconds untangling for alignment. A tactic known as ‘sliding’ is used to avoid any unwanted engagement with hostiles on grid with the gate, rather than inside the plex. Sliding simply means warping to the gate at 10 km and repeatedly clicking the ‘activate gate’ button as the ship exits warp. The basis of successfully attacking an occupied plex is understanding how they are defended, and countering that. Knowing typical fits for common ships is a valuable skill to determine what tactic the defenders may be employing and being able to exploit that whatever weakness that tactic may have. Let’s go over the list again, this time from the attacker’s perspective. Vs brawlers: A brawler is most potent at short range, take that advantage away while maintaining a point. A scram kiter with full tackle fit for superior speed is ideal for the job, although it has to be able to weather the early storm of short range fire upon entry. Even with a good counter, afterburner fit brawlers are formidable at plex defense. When attacking, one must assume they will apply full tackle and develop any strategies from that baseline. Vs scram kiters: Scram kiters main strength is the ability to control range once tackle has been applied. Again it must be assumed that this will happen upon entering the plex. The simplest counter against them is simply attempting to remove their range advantage, either using sheer speed or clever manual flight tactics such as slingshotting. However, because it is a plex, the defender will be starting at high velocity while the attacker begins stationary. Compensating for that difference comes at a price. The alternative is to field weapons able to effectively apply damage at scrambler range with ship bonuses and the right ammo. Ultimately the best counter to a scram kiter is a ship that negates their range advantage as quickly as possible, double stasis webifiers get the job done for instance. Vs kiters: Kiters only real defenses are speed and range. Take those away and they drop like flies. It is very useful to know what ships are typically fit for kiting, warping into a plex and taking a fight against a kiter in a ship with an afterburner for propulsion is asking for slow death. Barring ewar and another kiter, effective tactics against this type of ship include ridiculous speed, slingshotting, light missiles, and when there is more than one attacker, pulling. The chief nemesis of the kiter being dual-prop frigates able to reach extreme speeds such as Interceptors or Dramiels. Vs snipers: A fast sniper is one of the most difficult things to kick out of a plex. Often it is necessary to resort to ewar, simply denying the sniper the range advantage. Conventionally snipers are forced off or killed by approaching at speed and tanking the damage they dish out, using evasive maneuvers to minimize turret damage (sniper turrets have incredibly low tracking) and sheer speed against missiles. If there is more than one attacker pulling can be effective, depending on how quickly the sniper pilot notices the intended trap. Alpha strike: Alpha strike ships are seldom seen alone in plexes and a fleet of this type arrayed at optimal ranges inside a plex is a death trap. The best way to counter an alpha fleet is to make sure the entire attacking fleet warps in together and all have buffer tank. When inside, movement and fast target calling are the key to victory. At the end of the day Faction Warfare plexes are there to generate content between players. Although the system is sometimes maligned and slowed down by farmers, it often works quite well. Anyone can jump into a ship and get a decent fight without investing hours of their time.